Featuring 3 towns with 5 pictures from Highland County, “Restored Ohio” is scheduled for release on April 29, 2019. It’s the sequel of “Abandoned Ohio” (2018) & shows a different side of what physically remains of Ohio’s past. Many of the locations operate as businesses such as restaurants, hotels (former stagecoach stops), museums, & working mills. Description: It was one of the earliest villages in the county & had a church school, & blacksmith shop. The Evans family was the largest in the area & arrived with other pioneer settlers from Bourbon County, Kentucky in 1800. Description: John Timberlake built a stone house & grist mill in the early 1820s next to the waterfall on Clear Creek that the town was named after. Simon Clouser (1796 – 1881) & Elizabeth (Duckwall) Clouser (1797 – 1875) purchased the land in 1825 & moved into the stone house the following year. John platted Fallsville in 1848 with hopes of attracting a railroad but that never happened & he later moved out of the area. The town had 3 streets & around a dozen houses. Auburn Church was built in 1891 & the last official resident of Fallsville passed away in 1893 as it faded away into oblivion. Simon & Elizabeth were buried in Auburn Cemetery with their 3 daughters. There are newer residences in the area now & its reportedly haunted by the ghost of a Native American girl who knocks on doors on Christmas Eve in an attempt to show someone where a local treasure is buried. Description: The proprietor James Gall (1864 – 1942) was a teacher, farmer, & ran a general store & post office on the farm where he was born. James was buried with relatives in Marshall Cemetery at the intersection of SR 124 & Herbert Rd. The Countryman family also owned a lot of land in the area. Description: This small farming & postal town had a school. Description: It was another small farming, railroad, & postal town with a school. Description: Jacob & Enoch Smith were brothers of Dutch descent who came to Ohio with a group of settlers from Virginia in 1796. They built a saw mill & grist mill at the falls on Paint Creek & platted New Amsterdam in 1800 on land acquired from General Nathaniel Massie (1763 – 1813). The streets were mostly named after popular Revolutionary War veterans. Residential lots sold well in the town early on with cabins & some stores. The town didn’t get any other big businesses to keep it going though & disappeared after a few decades. Description: The town was founded by James Sharp (1799 – 1872) & Margaret (Cloud) Sharp (1801 – 1869) who were both born in Pennsylvania & met & married in Highland County. They had a few children & accumulated a 400 acre farm with funds raised by a saw mill & grist mill James constructed on Turtle Creek. The town lasted much longer than its post office & had a Methodist church & school. It can be found in the 1871, 1887, & 1916 Highland County Atlases. Daniel Sharp (1837 – 1907) operated a quarry on the old family land & was buried with relatives in New Lynchburg Masonic Cemetery on SR 134. His parents James & Margaret were buried with relatives in Mount Olive Cemetery on Mad River Rd. Description: Sicily was founded in the 1830s & platted in 1848 by John Huggins (1810 – 1860) from North Carolina & Isabella (Hindman) Huggins (1813 – 1899). They had a few children & large farm. A few town lots sold & it had a school & church congregation but no big businesses to create a population boom. John & Isabella were buried with relatives in Huggins Cemetery. Description: It had a blacksmith shop & a school. In 1805 Jesse Baldwin (1759 – 1820) & Hannah (Thornbrough) Baldwin (1760 – 1820) were the first settlers of what would eventually become Barretts Mills. Jesse built a saw & grist mill that also had carding & fulling capabilities. It was completed in 186. in 1806. Dr. John Boyd, one of the first physicians in Highland County, purchased the land & improved the saw & grist mill in 1823. He also constructed a new wool mill next to the bank of Factory Branch Creek. Barretts Mills also had a blacksmith, George M. Belleson, who died in 1856 & was buried in the Boyd Cemetery in the woods near Cave Rd. George’s son James C. Belleson was given the blacksmith work shortly before his fathers death. Dr. John Boyd later gave the mills to his son John Milton Boyd (1817 – 1913) who sold them to David Barrett (1829 – ?) in 1858. David married Sally A. (Weyer) Barrett (d. 1901) in 1855 & achieved the rank of captain in the Civil War. A covered bridge was built in 1862 that spanned Factory Branch Creek from Barretts Mill Rd to Cave Rd. The town had a post office from 1885 – 1907. One of the buildings that Dr. Boyd built turned into a hospital for victims of the 1918 flu epidemic. Many people likely perished in that building & we believe there are a lot more people buried in Boyd Cemetery than the 5 interments cited on findagrave.com. The house on Cave Rd across from Barretts Mill is reportedly haunted too. In the 1960s Jack Hope, a local property owner, purchased Barretts Mill & turned it into a tourist attraction. He also bought the nearby McCoppin Mill on the southeast side of Rocky Fork Lake in 1980. Unfortunately Barretts Mill & the covered bridge burned down in an arson fire in 1980, but it’s still an interesting place to visit with the mill foundation & bridge trestle intact. Thanks to Rhonda L. Henson for the lead on Barretts & McCoppin Mills! To get to the waterfall, keep going straight onto the trail past where the gravel ends on Fallsivlle Lane. Building foundations & an old horse tank, the only one we’ve ever seen in a total ghost town, are on a trail to the left & heading south at the end of Fallsville Lane. Hunting goes on back there so wear bright colors, be extra safe, & as always, respectful of any other outdoor enthusiasts. The hunters we’ve met were all very nice & even gave us some info on where to look. It’s a cool place to snap some nature photos too. David Reece first settled there in 1829 & built a saw & grist mill on Rocky Fork Creek. The mill production started in 1831 & changed ownership several times over the next 150 years. In 1848 it was bought by Henry Stacy Foraker who had married David Reece’s daughter. Their son Joseph Benson Foraker (1846 – 1917) ended up being a U.S. Senator & a two time governor of Ohio. In 1895 the mill owners were C.M. Overman & Thomas Costello. Costello bought out Overman’s share & changed the mills name to Lodores, due to the fact that the poem “Cataract of Lodores” was posted at the mill. Lodores had a post office from 1898 – 1903. Thomas Costello died in 1906 in a machine accident at the mill. His body was found in Rocky Fork Creek. John Allen McCoppin (1847 – 1931) bought the mill later that same year & remodeled it. The mill opened back up in 1909 & changed ownership a few more times. Lynn A. Sydenstricker & his son John were the last operators. They stopped production in 1979. The mill was bought by Jack Hope in 1980, the same year he bought Barretts Mill. McCoppin Mill currently sits of private property but can be seen from the bridge on McCoppin Mill Rd. The town’s abandoned one room schoolhouse is next to McCoppin Mill Rd south of the mill. 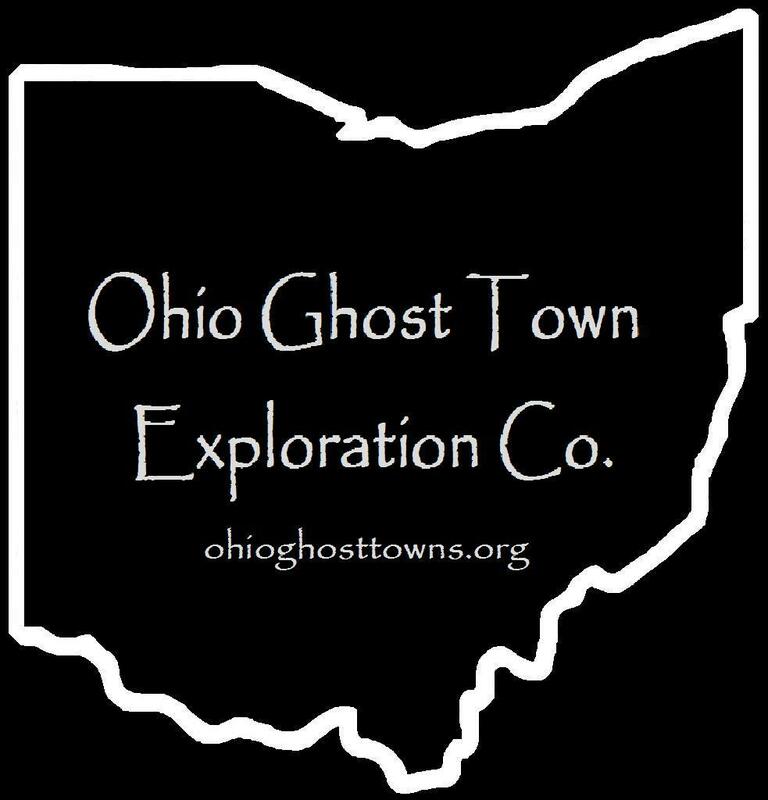 Featuring 3 towns with 7 pictures from Highland County, along with historical research about the locations, “Abandoned Ohio” was released by Fonthill Media & Arcadia Publishing on October 1st, 2018. It’s packed with history, ideas for road trips, & also makes an awesome birthday or holiday gift!